This was my first trip to the Bugaboos, and I loved every moment in the spectacular area. 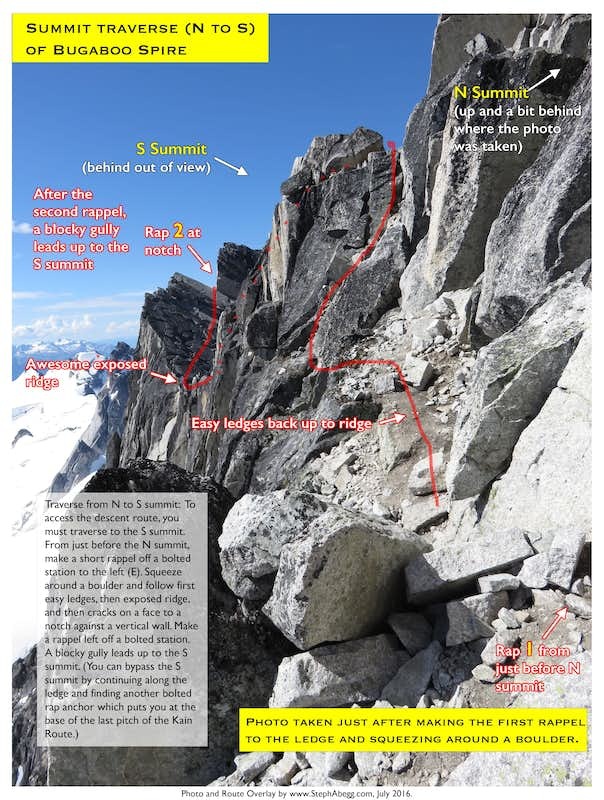 This trip involved three successful climbs of the moderate Bugaboo classics—NE Ridge and Kain Route on Bugaboo Spire, and the West Ridge of Pigeon Spire. Click to jump to specific climb or scroll down the page. Along the road between Golden and Radium Hot Springs, there is a turnoff that takes you about 40 km along a dirt road to the trailhead for the Bugaboos. Fortunately for me, Jason had been to the Bugaboos earlier in the summer, so he knew exactly where to turn (we turned off just after driving by a small convenience store, as I recall). We made it to the trailhead by 6pm (elevation 1,500 m / 5,000 ft). Before starting the grueling hike, we had to wrap the truck in chicken wire to protect against the rubbervorious Bugaboo Porcupine. It took us 2 hours to hike the 4.6 km and 720 m (2,400 ft) to the Kain Hut. By this time it was raining pretty hard and getting dark, but we continued up the hill to the right towards Applebee Camping Area (Applebee would be closer to the climbs and also $5/night as opposed to $22/night in the hut). It took us another hour to hike the extra kilometer and 250 m (800 ft) to Applebee Dome. We stumbled around boulders a bit in the dark trying to find the trail and the camping area, but eventually we saw a headlight which showed us where the camping plateau was (in general, if you head uphill and rightwards and make sure to cross a rather big stream, you will find Applebee, since any further right and you would be climbing Eastpoint Spire or any further uphill and you would be swimming in a lake). We set up the tent and crawled inside, and were asleep by 11pm. Although we had arrived in the rain the night before, we woke up at 6:30am to promising sun and scattered clouds. My main goal of the trip was the NE ridge of Bugaboo Spire, so we decided to attempt the NE ridge. At 7:25, we headed for the col. So, seeing as we were on the wrong side of Bugaboo Spire to climb the classic NE ridge, we decided to climb the Kain Route, a moderate route up the south ridge of Bugaboo Spire. We would climb the NE ridge the next day, we decided. Since the Kain Route is the descent route of the spire, it would familiarize us with the route in case we had to descend in the dark after the next day’s ascent of the long NE ridge. Until the gendarme near the summit, the Kain route is mostly a Class 4 and low Class 5 scramble, so we climbed most of it unroped. Just before the gendarme we roped up. I led the gendarme pitch, which had an exciting airy and unprotected traverse. This was my favorite part of the route. From the top of the gendarme, it was an easy pitch to the south summit (3,204 m / 10, 500 ft). We arrived on the summit at 11:30am, 4 hours after leaving camp. It took us 3.5 hours to descend the route and arrive back at camp. 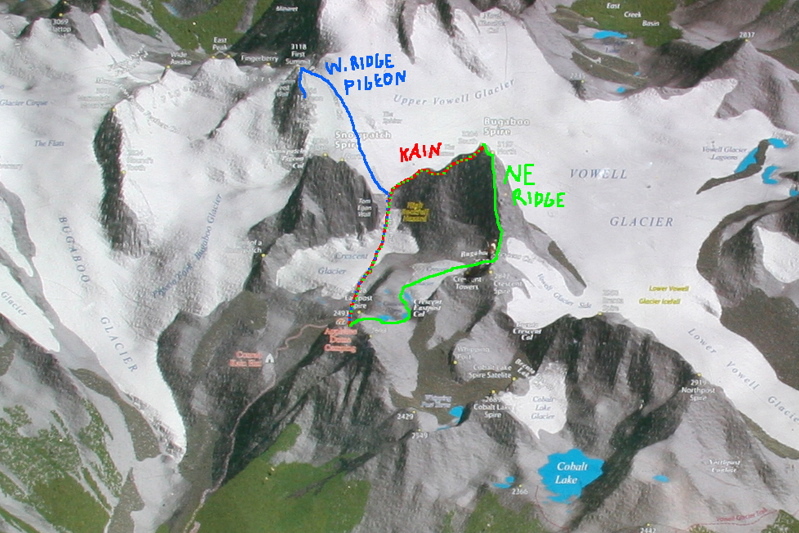 (There are 6 rappel ring stations—25 m rappels—on the upper Kain route, after which you can scramble the lower Kain Route to the Bugaboo-Snowpatch col. Station 1: from the block just south of the summit; Station 2: down the east side of the gendarme; Station 3: down the rest of the gendarme from behind a flake; Station 4: just under Station 3; Station 5: down the east side from the ridge crest after a traverse south along the ridge crest; Station 6: just under Station 5. From here scramble down the Kain route to the col). The Kain route was a good warm-up climb, and especially useful to scope out the descent route of the spire, but there are plenty of other routes in the Bugaboos I would climb instead. We woke up to clear, starry skies and decided that this would be the day to climb the NE ridge of Bugaboo Spire. With such an amazing ridge line, it is not surprising that the NE ridge of Bugaboo Spire is a popular climb (it is one of the "Fifty Crowded/Classic" climbs). Jason and I began our hike to the Bugaboo-Crescent col at 4:30am, in the dark. We weaved around a bit, managing to navigate the longest and trickiest path around some lakes, until we finally ended up on the Crescent Glacier leading to the col. We saw only one party ahead of us, but there were plenty of headlights from parties behind us. We had some difficulty finding the right-slanting ramp up to the col in the dark, and by the time we found the giant cairn marking the base of the ramp, 4 parties were ahead of us. Here is a photo of the route one would ideally take to the col. It should take about 1 h 15 min to get to the base of the col, depending on hiking speed and darkness. We put on our climbing shoes and started soloing up the low Class 5 ramp to the col. The rock here was loose, and we had to dodge a few rather large rocks kicked down by climbers above. I was frustrated that so many parties had passed us; add to this flying rocks, pressure from other parties behind us, and a rather intimidating looking climb now visible in the morning sun, and it was becoming quite the nerve-racking situation. Jason decided he would rather spend a relaxing day basking in the sun with the chipmunks at camp, so we started back to camp. I was pretty disappointed, but as luck would have it, the last party approaching up the Crescent Glacier was a group of three. Perhaps they would like a fourth, Jason suggested. The three climbers turned out to be friendly French Canadians, and welcomed me to their team. I would climb with Nivea, a friendly 32-year-old field ecologist. And Jean-Michel and Hugo, two brothers, would share a rope. So I would get to climb the NE ridge afterall! We headed for the col, while Jason headed back to his sleeping bag, chipmunks, and Suduko. By the time we made it to the top of the Bugaboo-Crescent Col, there were 6 parties ahead of us. Five of the parties were still on the ground. At 7:30am we were settling down for a long wait at the rope-up terrace. It was sunny, but the wind made it quite chilly. Below are photos of the crowds at the base as well as the view up the first and second pitches. We waited at the base of the NE ridge for 3 hours (there was a slow trio at the front that was setting the pace for the day). For awhile, the French Canadians and I were the last climbers in line for the route, until two guys showed up, bemoaning a frustrating delay of getting off-route in the ascent up the col. Finally, at 10:30am, we were climbing. Jean-Michel and Hugo climbed ahead of Nivea and me (Jean-Michel led all their pitches, and Nivea and I swung leads, with me leading all the even-numbered pitches). The three French-Canadians were solid climbers and fun people to spend the day with, and I was glad they let me team up with them. The first pitch was a fingery 5.8, apparently the crux pitch of the route (although I found the 5.6 crack of pitch 4 to be more difficult and the first pitch to be pretty easy). The second pitch was an undemanding 5.6 with shallow cracks and jugs. The third pitch began by downclimbing to the left from a pedestal, and then continued easily up to a tricky 5.7 step across a face. The fourth pitch was a 5.6 long right-facing shady corner (cold fingers!). The fifth pitch began as 5.6 and entered the long low class 5 chimney system. The sixth pitch was a couple ropelengths of simulclimbing up the easy 5th class chimney. The seventh pitch was a short climb around a corner with a 5.7 move. The eighth pitch was easy 3rd-5th class climbing along the ridge to the North summit. 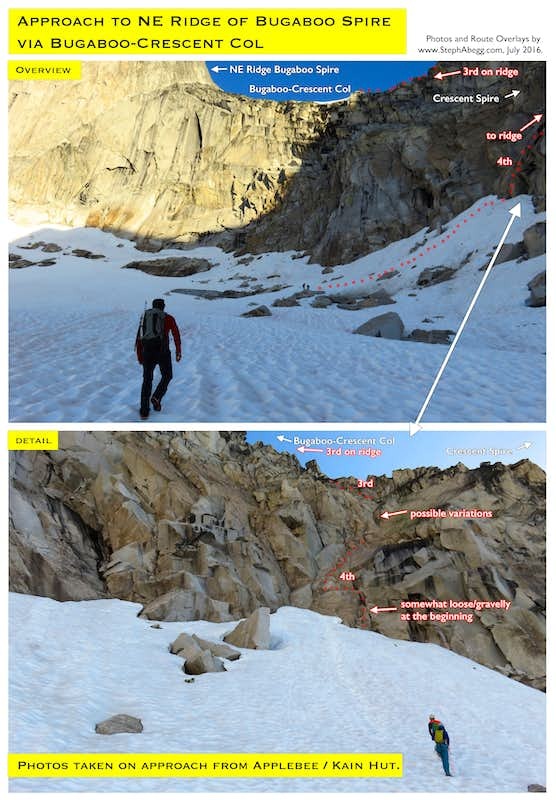 Below are photos of (1) the route up the NE ridge, and (2) the easy 5th class chimney system of the simulclimbed sixth pitch. We reached the north summit at 4:45pm. From here, we made a short rappel down the east side of the spire, and then traversed across to underneath the south summit, where we had to make another short east-side rappel. The following photo shows the summit traverse. We were still below the south summit, and we had the option of traversing around and doing the easy last pitch of the Kain Route, or we could avoid any further traversing and climb up the 5.7ish rock above us. We decided to head straight up. I led this short pitch. We reached the (higher) south summit (3204 m / 10,510 ft) at 6:30pm. Below is a photo of Nivea on the South summit, with Jean-Michel and Hugo in the background. After sharing a summit Toblerone (these are my kind of climbers! ), we began our rappel down the upper pitches of the Kain route. Fortunately, I had done this the day before (see my above report of my climb of the Kain route for a description of the descent), so there were no surprises and I knew we could be back at camp in 3.5 hours. Also, Jean-Michel had climbed the NE ridge before, so he led us unerringly down to the Bugaboo-Snowpatch col. It didn’t get dark until we were on the snow heading down from the Bugaboo-Snowpatch col. From here, our camp was easy to find. Jason showed up to help us carry some of our gear back, and we made it back to camp by 10:15pm. I had been away from camp for 18 hours. The NE ridge is a long route, but it seems to me that the main reason to get an alpine start is to get ahead of the crowds! But the climb was certainly worth the waiting! Thanks to Nivea, Jean-Michel, and Hugo for letting me climb with them and sharing their summit chocolate. Update: I climbed the NE Ridge again in July 2016. Here are some updated route overlays from my 2016 trip report. See my 2016 trip report for more photos. The day before had been a long day for me, so Jason and I decided to climb something easy and short. The west ridge of Pigeon Spire was just the climb. It looked like it would be another sunny day. So, at 10:45am, we left Applebee Dome Camp, an hour later were on top of Bugaboo-Snowpatch col, and an hour after that were at Pigeon-Howser col, at the base of the west ridge of Pigeon Spire. Below is a photo of the route along the west ridge as seen from the approach along the Upper Vowell glacier. We left our ice axes and crampons and extra gear at the col and began our unroped climb up the ridge. The rock was nice and rough. For the most part the climb stayed on the Class 3/4 ridge. It took us 11 minutes to get to the first summit, 10 more minutes to get to the second summit, and 12 more minutes to get to the third summit. There were some straightforward low 5th class moves between the second and third summit. Below are photos of (1) the second and third summits taken from the first summit and (2) the route we took up the third summit as seen from the second summit. To descend, we made two 25m rappels down the west face and then downclimbed the west ridge we had come up. This climb was easy and short, but the exposure and the view were great. Here are photos of (1) Jason on the summit and (2) Jason walking along the ridge on the descent, with Howser Towers in the background. On the way home from the Bugaboos we stopped to climb Mt. Sir Donald, another classic climb. Check out my climbing report for Mt. Sir Donald. Snowpatch Spire (left), Pigeon Spire (center), and Howser Towers (right) from top of Bugaboo Spire. Howser Towers from descent of the Kain Route (south ridge) on Bugaboo Spire. Snowpatch Spire in morning sun. The nice outhouse at Applebee Dome Camp. Friendly chipmunk at Applebee Dome Camp. ….or not so friendly? Jason relaxing at camp after climbing the west ridge of Pigeon Spire. We were lucky to get nice weather. Reflection of Crescent Peak in a pool of water. Bergschrund near the Bugaboo-Snowpatch col.
Climbers wanting to stay and take advantage of the good weather. Morning light to southeast of Applebee Dome Camp. Snowpatch Spire in morning sun. Bugaboo Spire (right) from the summit of Pigeon Spire. Looking southeast from the summit of Pigeon Spire at Hound’s Tooth, Marmolata, Flattop Mtn., Howser Peak, Pigeon Feathers. Climbers heading down Pigeon Fork of Bugaboo Glacier on the south side of Pigeon Spire’s west ridge. Soon after this first trip to the Bugaboos in 2006, I started to make plans to return to this amazing climbing meca. 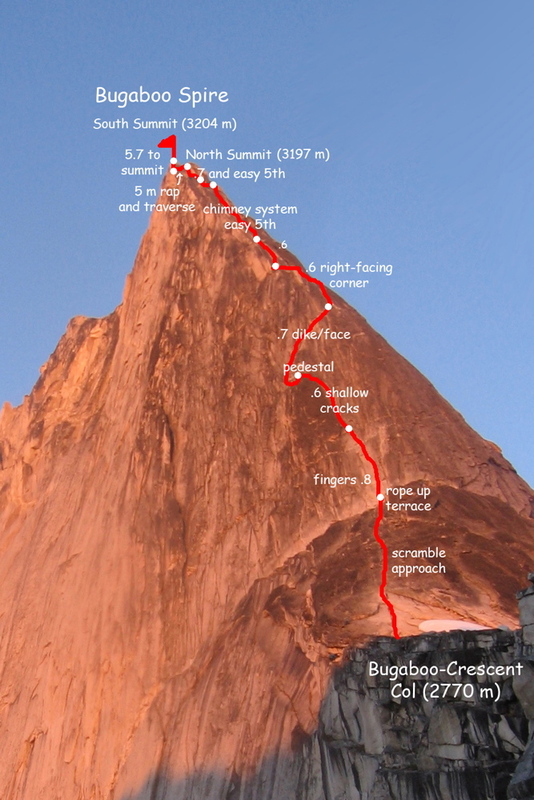 I was intrigued by the Beckey Chouinard route on South Howser Tower (a Fifty Classic) as well as Snowpatch Spire (the spire which towers above Applebee Camp). So, a year later, in August 2007, I returned to the Bugaboos with my friend Clint Cummins. Our trip to the Bugaboos was a grand success. 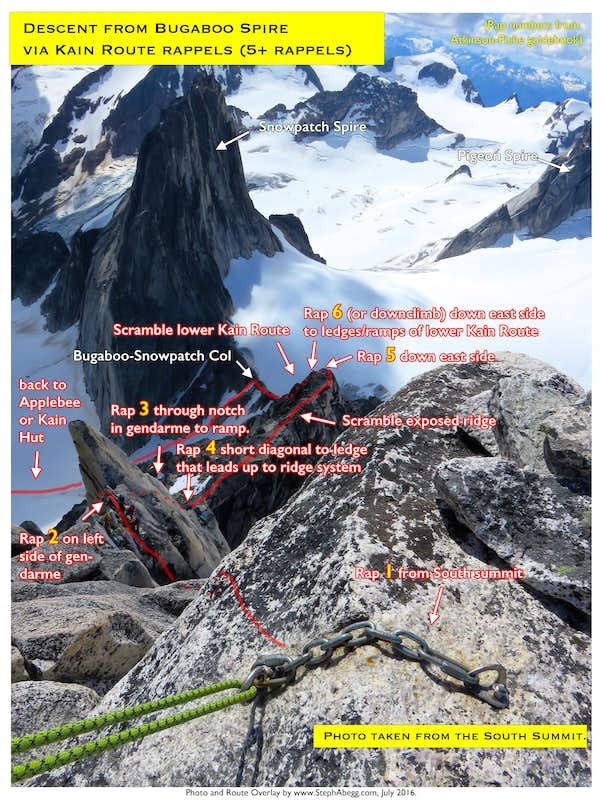 Click this link to see the trip report detailing our climbs of The Beckey Chouinard on South Howser Tower and the SE Corner (Snowpatch Route) on Snowpatch Spire. South Howser Tower from the west. 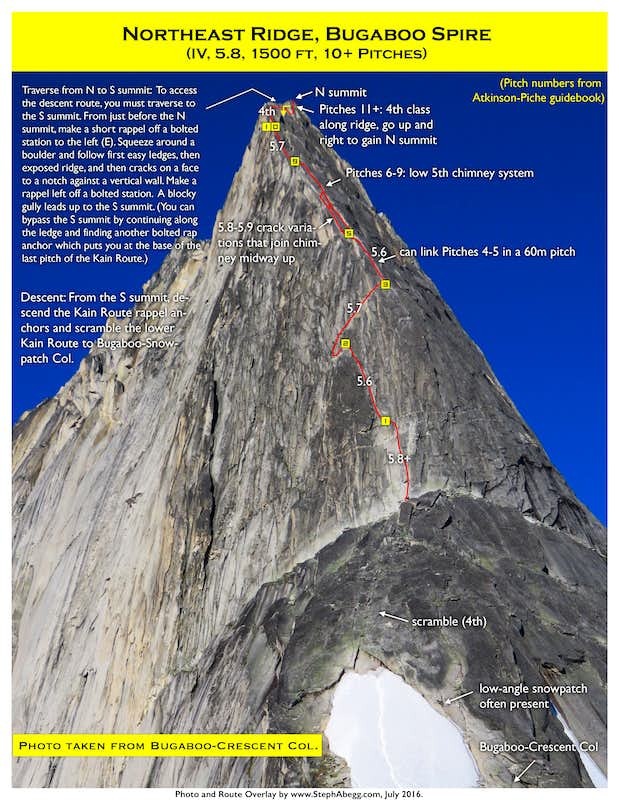 The 20-22 pitch Beckey Chouinard route follows the long crest. Hound’s Tooth from parking lot. I climbed the NW face (from the right), a Class 3 scramble. Snowpatch Spire from Applebee Dome Camp. The SE Corner (Snowpatch Route) goes up the left ridgeline above the snowpatch for 19 pitches. In the years since this trip report, I've had the incredible experience of flying over the Bugaboos with pilot/photographer John Scurlock. To see some of these aerial photos, check out my aerial photography page ("aerial trip reports" section).